Texting to other networks is costly if you’re not registered to unlimited all net text promos from our local Telco’s. 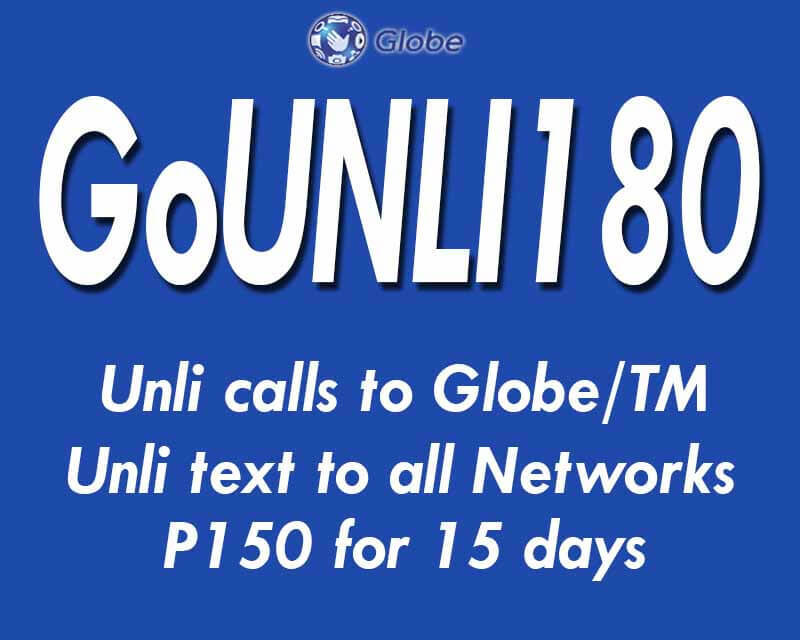 With Globe Prepaid, you can subscribe to their GoUnli180 offer that gives 15 days unlimited text to all networks plus unli calls to Globe and TM (Touch Mobile) users. It only cost you 180 pesos for 2 weeks, which is very reasonable if you use it to communicate with your love ones, friends and small business clients. Aside from call and text, you can also connect to the internet as GoUNLI180 includes free 150MB of mobile data for surfing. You can use it to check important emails, send urgent message online and access other online apps. To subscribe GOUNLI180, just use the correct keyword format provided for your reference. If you want 1-month validity try the new GoUNLI350 promo good for 30 days. You can also register via Globe GoSakto menu, just *143# then select Combo Promos or option 6 then look for GoUnli. Select your desired GoUnli offers then press 1 to subscribe. To call while subscribed to this promo, all you need to do is dial the 11-digits Globe/TM mobile numbers of the contact person you are trying to call. Tip: Wait for the SMS notification from Globe 8080 before you start using the promo. To check promo status or inquire for remaining balance, just dial *143# menu and manage your subscription. You may text GOUNLI180 STATUS to 8080 to check the validity of the promo. 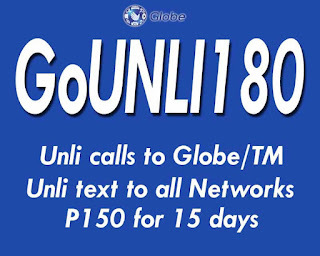 You can also text GOUNLI180 STOP to 8080 to stop. Please maintain P1 to continue using the service up to 15 days.